11.5 x 9.5 x 5.9 cm. These "textbook-perfect", highly lustrous, dark golden-yellow chalcopyrites are specimens from the past from the Alimon Mine at Hauron, Peru. 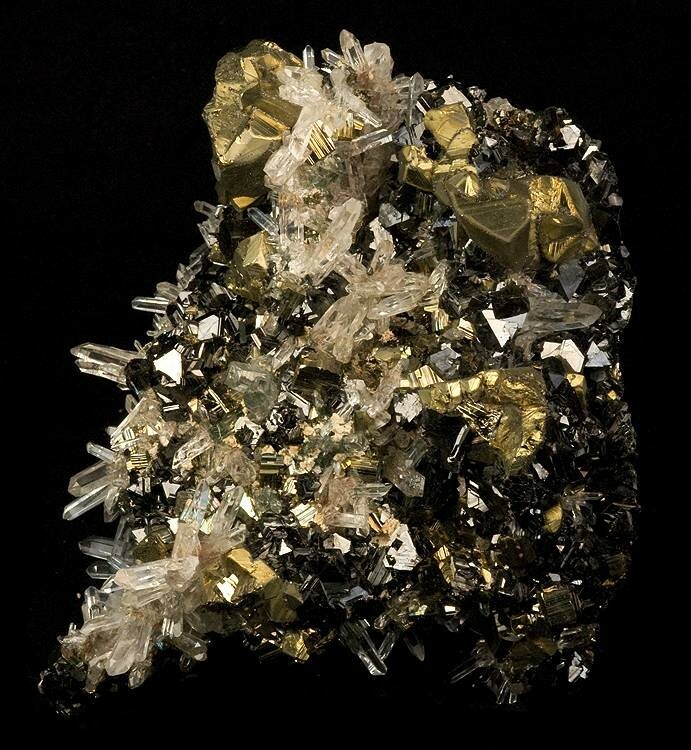 A beautiful, two-sided, cabinet specimen, such as this, with water-clear quartz crystals, lustrous, black sphalerites and a scattering of striated pyrite cubes make for a classic and aesthetic combination piece. Some of the chalcopyrites are twinned and crystals reach 2.3 cm. The stunning backside of the piece is covered with radiating sprays of water-clear quartz crystals. Specimens such as this came out in the late 1980s to early 1990s, with none since. Ex. Richard Hauck Collection.